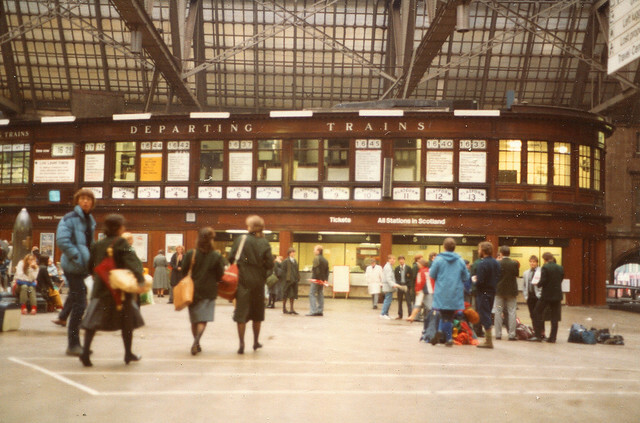 Glasgow 1983: Central Station, originally uploaded by Simon_K. So I managed to find a photo of the ticket office at Glasgow Central as it used to be. From 1983, to be exact, which is when I would have started using the station on a regular basis as I commuted from Troon to the Art school and back. The time is half four in the afternoon, which explains the profusion of green blazered school kids. If I remember rightly that was the St Aloysius school blazer. They had school buildings up near the Art school so we would see them around a lot. We occasionally used one of their playgrounds to throw an American football around when we needed some excercise. Also, some of you may remember Duglas Stewart’s article in the Coca Cola Cowboy fanzine about ‘Poocheramas’. I’m sure there was reference to St Aloysius blazers travelling on the train from Central to Johnston in that.